This new book by Dr. Houghton is a long-awaited and welcomed addition to the important issue of law and grace in the believer’s life. 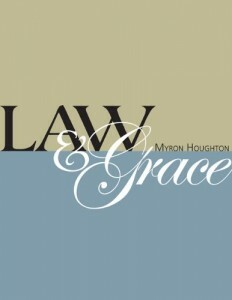 It could as well have been titled, “Law, Gospel, & Grace” because that is the three-fold division Dr. Houghton suggests as a Dispensational solution to the confusion over law and grace, especially when contrasted to the Catholic and Reformed (as well as Lutheran) views. Whereas Catholics see law and grace as both essential to salvation, Reformed see the moral part of the Mosaic Law continuing, and Lutherans see the law as a present guide to believers, Dispensationalists who distinguish carefully between Israel (law) and the church (grace), believe that the whole law is done away and yet still do not see grace as lawlessness. Houghton’s great addition to the discussion is to see Gospel and Grace as distinct in the life of the believer. The law only condemns and shows the sinfulness of man. Gospel offers pardon and righteousness totally apart from the law. Grace is a new guide for the believer’s life which makes demands upon the believer (while at the same time securing his eternal salvation) motivated by love and gratitude, and thus fulfills and surpasses the righteousness of the law. “I believe significant problems surface if we make only two distinctions. If the categories of Law and Gospel are the only ones recognized, how does one describe the believer’s obligation to live a life of obedience to God? After all, we have already recognized that God’s law makes demands, while the gospel does not. Then how should we explain why the New Testament makes demands of believers today? If these demands cannot rightly be called Gospel, then what are they?” (p. 11).